weekly Coffee Mornings, Mobile Library & the Council's Rubbish Freighter service. BMRA: NEW for 2019- the monthly Residents' Association meetings are now open to the public. BMRA: Monthly Residents' Association meeting. Thursday's 10:30 - 12:00 in the Memorial Hall - All Welcome. Coffee / Tea and Biscuits available for a small charge. Monthly ladies social evening - details and dates. 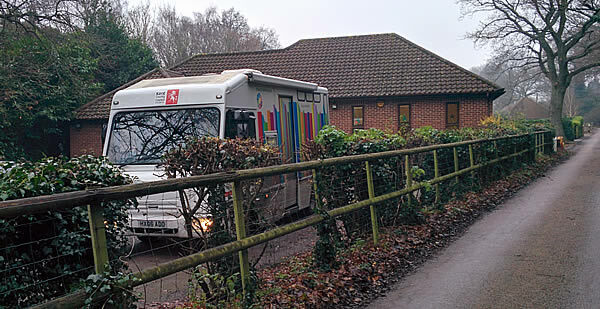 The Library Van visits (Hall car park) every second Thursday. Badgers Mount Parish Council (via Sevenoaks District Council) provides a 'Saturday freighter service' for bulky waste. It calls at the bottom of Badgers Road (junction with the Orpington Bypass) 10.15-11.00am. It (normally) operates on the second or third Saturday in January, April, July and October. We regret fridges, freezers, cookers, cast iron boilers or baths, long metal poles, building materials, manure, large parts of engines or vehicles or hazardous waste cannot be accepted. Hazardous waste now includes items like low energy bulbs, fluorescent tubes, TV’s & computer monitors, batteries, oil tins and filters, paint and paint tins and chemical containers. These items cannot be accepted on the Saturday Freighter service and must be taken to your nearest Household Waste Recycling Centre. Compostable garden waste cannot be accepted.